A small gathering this year, just 4 people, Chris, my parents and I. Not that I would let that stop me from making too much food. I had the usual suspects: turkey, mashed potatoes and stuffing. Then, a few things to try. In consideration of my vegetarian mom, I make the stuffing with vegetable broth. This year I am also adding a wild rice dish, also vegetarian. I did not plan a strictly vegetable dish. I have a in-law family recipe for green beans as a back-up but I’m hoping no one misses it. I was never a fan of the green bean casserole anyhow. I also wanted to make an apple based dessert after buying a bag of Michigan Empire apples at Whole Foods. For pre-dinner noshing, we had onion dip (from 101 cookbooks, a personal favorite of mine and always a hit at parties) and chips with cheese, crackers and a fruit platter. Smashed Red Skin Potatoes: Made these last year too, but subbed thyme for rosemary this year. Still think they are awesome on every level. Creamy, good on their own but also tasty with gravy. The cream cheese adds a tangy level of flavor you won’t get using milk. I am still interested in making a whole mean of mashed potato varieties some time, just not for a holiday dinner. 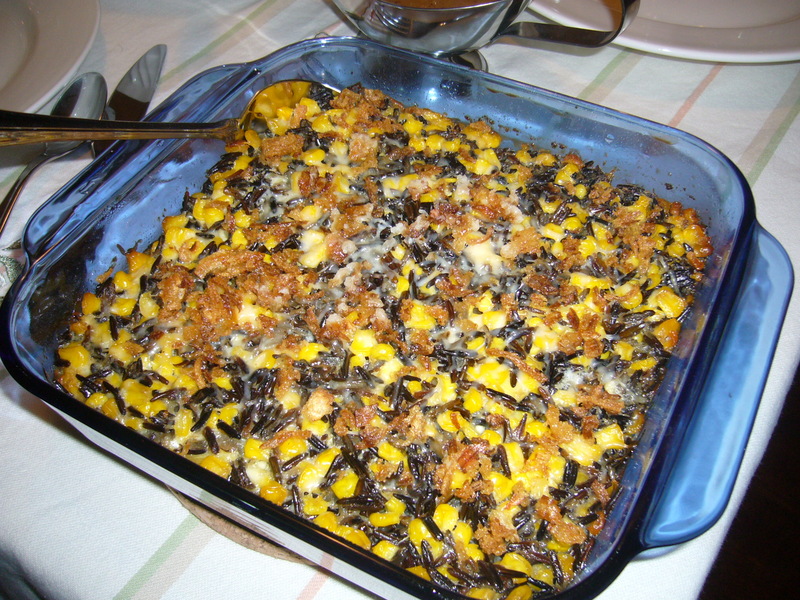 Wild Rice-Corn Casserole: From Pioneer Woman, using of course, frozen corn because you can’t find fresh sweet corn in Michigan in late-November. Comments on PW’s site indicate this is either a love it or hate it dish. It was a love it dish for us. I added a little shredded cheese and onion crisps for the last 10 minutes of cooking (reasons listed below). My dad, the usually quiet type, actually commented on my Facebook about this dish! Stuffing/Dressing: No recipe really. I used some stuffing cubes with seasoning, adding celery and onions, chopped apples, and vegetable broth, generally following the guidelines on the bag of cubes. Baked in the oven, separate from the bird, again in consideration of my mom’s needs. Chris doesn’t really like it this way and has been correcting my use of the word “stuffing” as it was not actually stuffed in the bird. Whatever. Garlic-Rosemary Roasted Turkey: I brined the turkey overnight, just using salt, sugar and a handful of thyme plus a bit of rosemary. The next day, the turkey is thoroughly rinsed and allowed to air dry slightly. Then, using the cell phone photo of a recipe in Cooking Light magazine (as seen at the dentist on Wednesday but later located on the internet), I created a butter-garlic-rosemary rub to put under the skin on the breasts then over the skin everywhere. Gravy: No picture, no recipe. After taking the turkey out of the oven, I removed it to a serving dish and covered it in foil to rest. The drippings from the pan were poured off and I set the pan over two burners set to medium. Using a wooden spatula, I scraped up the bits and goodies, then added a few tablespoons of flour to make a paste. I then added 2 cups of chicken broth before mixing in the drippings which had been skimmed of most of the fat. Cook over medium-low until a little less thick than you want at the table. Because of that garlic paste on the bird, this gravy was uber-garlicky. And delicious. **Dandelion Greens: Even though I didn’t plan any green vegetable dish, my mom mentioned having a bag of dandelion greens and suggested I could do something with them. I wasn’t sure if Chris would like them as they can be quite bitter but he does like arugula, a lot. I really did not want to do something like creamed spinach or otherwise add a lot of cheese/cream/dairy to the greens. I decided to just saute them in garlic and olive oil with some lemon juice added at the end. I also added a bit of sugar to counter the bitter. I should have added a lot of sugar. Even then, though, I don’t think this dish was going to work. The leaves were fully wilted but the stems were still very crunchy, even after trimming a fair amount of stalk off. Either this batch was just far too bitter for anyone in the family to eat or every recipe on the internet is only for people who really like bitter greens because all the sauteed versions I found recommend cooking for no more than 10 minutes; seemingly nothing was going to make it less bitter except perhaps more sugar. Which defeats the purpose, in my mind. Apple-Cranberry Crumble: No picture, sorry. Actually, my parents didn’t stay to eat dessert so Chris and I tried this later on. It was decent, the crumble topping was especially tasty- of course I’d expect that of something made with brown sugar and butter! I should have peeled the apples. The recipe is Martha Stewart but I found it by way of the blog Lisa is Cooking. As Lisa did, I skipped peeling the apples but I think I would have been happier if I had although it could just be that the Empire apples were not the best choice even though they are recommended for baking. Maybe a little more sugar? I did add a few splashes of our apple brandy from Uncle John’s Cider Mill & Fruit Winery in St. Johns. I had planned to serve this with ginger ice cream but didn’t. I guess I’ll just have to eat that some other way! Now that you know how the meal came out, let’s talk about how it was made. The night before, I made the carmelized onions for the onion dip and cooked up the wild rice too. And of course, brined the turkey. When my parents arrived Thursday morning, following the Lansing Turkey Trot, I made up the dip and pulled the turkey out of the refrigerator. We had our snacks and generally, I goofed around. I planned to have dinner about 5:30-6pm so there was plenty of time. Eventually, I prepped the turkey (it sits out for 1 hour with the rub on it) and started assembling my stuffing, corn/wild rice dish and scrubbing potatoes. The turkey is roasted at 500° for 30 minutes then the temperature turned down to 250° and cooked until thermometer in the thigh reads 165°. My turkey, round about 11 lbs was the same size as the recipe version so this should have equaled 2 hours. During the initial 30 minute high-heat roast, you can really hear the fat cracklin in the oven. And, upon opening the oven to insert the thermometer for the 2nd phase, I set off our smoke detectors briefly. Oops. Our oven, a gas version, doesn’t actually have a reading for 250° on the dial. It goes from “warm” to 260° to 300°. Knowing that it runs a little cold anyway, I set it just below the 300° mark. After about 45 minutes, I put the stuffing/dressing and the wild rice dish in the oven too. Normally, these only need 30-45 minutes but with the lower temperature for the slow-roasted bird, I decided this would work. The temperature on the bird was still rising so I didn’t pay much attention when I put these dishes in alongside. Another 30 minutes later (so 1 hr 15 min down, 45 to go), I realize that A) the temp isn’t going up anymore and B) I don’t hear anything “cooking” in the oven. I open it up and immediately notice that abscence of heat. I fiddled with the control and couldn’t make the flame come up, even cranking it to broil. I realize this means the pilot has gone out- randomly since we never shut the oven off, at all. According to the directions on the oven, the door, racks and bottom of the oven have to be removed to access and light the pilot. Fortunately, the oven door comes off easily but we still had to take all the pans out. As I did so, it became apparent that the oven had been off for awhile as I could remove everything, including the roasting pan which had been in for 30 minutes at 500° degrees, with my bare hands. After removing everything, finding a lighter and getting it lit, we started reassembly, only to have it go out again. It took four or 5 tries for it to stay lit. After you light the gas, you have to hold the knob down for 60 seconds and they should say “60 seconds minimum.” Of course, you can’t turn the oven to on yet because otherwise you’ll scorch a finger or two during reassembly. All told, this process took 30 minutes and overall delayed dinner by about two hours. I still made gravy though- must have my gravy for my turkey. And potatoes. And stuffing. **Notice the little gizmo next to the dandelion greens? Its our Vinturi wine aerator and it rocks! One of many wedding gifts used during this meal including new wine glasses and the platter upon which the turkey is sitting. 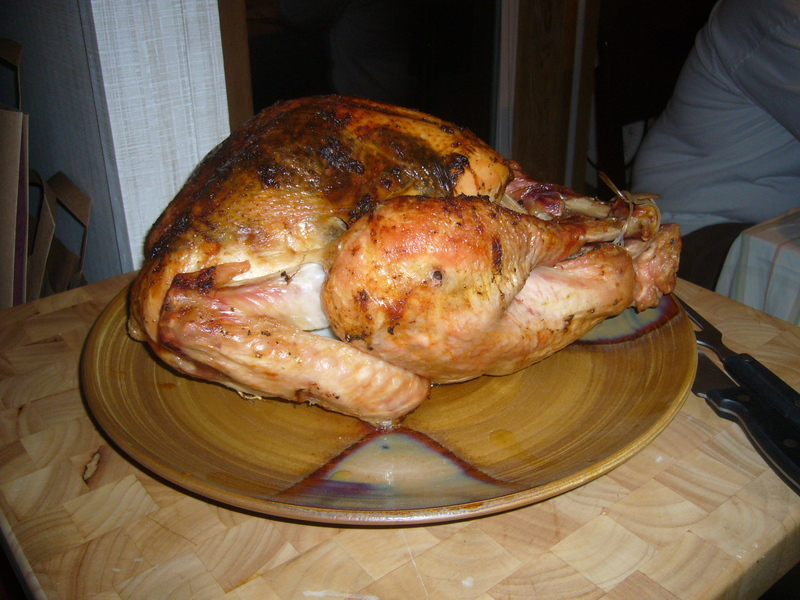 **The turkey recipe from Cooking Light advises you to remove the skin after the formal presentation. HA HA HA. Do it if you want but we did not want. I have always called it stuffing. Probably because we ate a lot of Stovetop Stuffing when I was younger. During my college years, I’d buy it in cannisters and make 1-2 servings at time. Or, I admit, eat the dry product right from the can. I still eat it on occasion but I’m more likely to buy plain breadcrumbs and season them up so I can control the salt levels. Ditto for Rice-a-Roni and other packaged starches. During college, I ate a lot of things like ramen noodles. It was super cheap, right? After being trapped in my apartment with no power for 3 days following an ice storm, I couldn’t look at ramen for a long time. Fortunately, during the outage, I was able to use my old-fashioned (i.e. non-electric start) gas stove to eat. And ramen plus assorted sauces, spices and frozen vegetables were my sustenance for those 3 days. 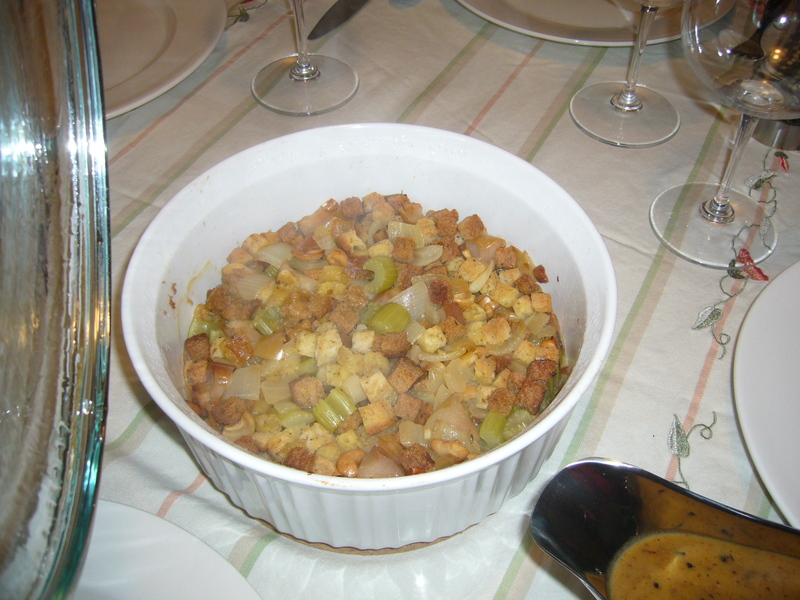 Stuffing is one of the requirements at Thanksgiving. As I mentioned previously, I call it stuffing whether its in the bird or out. I visualize dressing as this mushy bread-like mash that we would have at Grandma-in-Iowa’s house over the holidays. Ironically, that stuff usually was cooked inside the turkey and should have been called stuffing. I’m making dinner on Thursday. It will be served about 6pm. That’s dinner time. In Iowa, dinner was the big meal eaten at about 1pm. And then supper came later and was not so heavy (usually). While I do occasionally refer to dinner as supper and we used to jokingly call a late lunch “lupper” or “linner”, I just don’t think of the post-work meal as anything but dinner. The regional nomenclatures fascinate me. Although I make stuffing periodically, I don’t really have a recipe for it. Bread crumbs, onions and celery, maybe some nuts and/or dried fruit plus seasonings like thyme and sage. Moisten with broth and butter, bake and voila. Preheat the oven to 300º F. Spread the bread cubes out on two cookie sheets and bake for about ten minutes or until a bit dried out, not browned. Meanwhile, heat the 1/4 cup of butter and olive oil over medium heat in a large sauté pan. Add the onion, celery, fennel and celery seeds, rosemary, salt and pepper and sweat the mixture for 20 minutes, keeping the heat low enough so that the vegetables don’t color – you just want them to get soft and sweet. Turn off the heat, add the parsley and let the mixture cool for about ten minutes in the pan. Add the bread cubes and 2 cups of stock; stir to evenly distribute. Let the mixture sit for about an hour to let the flavors really get into everything (now’s a good time to work on your other Thanksgiving dishes!). Reserve two cups of the stuffing for the turkey if desired. Set the oven to 350º F. Put the stuffing into an ovenproof baking dish (you could even leave it in your sauté pan if it doesn’t have plastic handles – one less thing to wash!). Pour over the remaining stock and dot with the remaining tablespoon of butter. Bake for 25 minutes, or until the top is lightly browned. *Okay okay, Gwyneth isn’t actually my friend although I’m sure we’d have fun together in the kitchen. She’s actually Gwyneth Paltrow, the actor and writer of a weekly newsletter called Goop.